Police and emergency workers stand near the body of a man shot dead by a lone gunman on Monday in Bratislava, Slovakia. (CNN) -- A gunman killed eight people and wounded 14 in Bratislava, the capital of Slovakia, on Monday morning, officials said. The state news agency TASR, citing the interior minister and police corps president, said seven people were killed in the shooting; a spokeswoman for University Hospital of Bratislava said one of the wounded had died. After being cornered by the police, the gunman shot and killed himself, Slovak Interior Minister Daniel Lipsic and Police Corps President Jaroslav Spisiak told reporters near the crime scene. 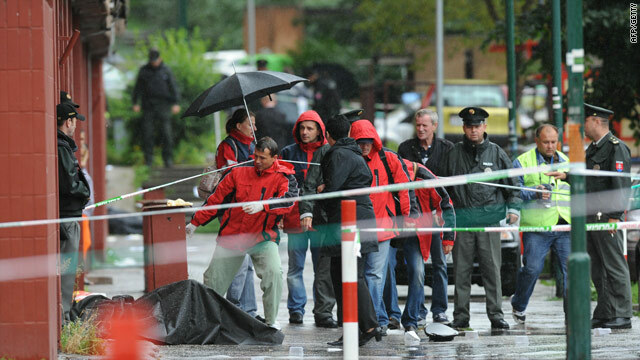 The shooting took place in the Bratislava neighborhood of Devinska Nova Ves, TASR reported. The gunman, who was using an illegally obtained assault rifle, was carrying two other guns and ammunition, Spisiak said. Lipsic said a police officer was wounded in the shooting and was in a stable condition. Of the wounded, who were taken to hospitals in Bratislava, "one patient is in critical condition, three more are in serious condition," Health Minister Ivan Uhliarik told TASR prior to the reported death of one of the victims. Uhliarik said the remaining victims were "stabilized." TASR reported a three-year-old child was among those wounded. Spisiak told TASR the police received a call reporting shots heard in one of the flats in the apartment building. When police arrived at the scene, the gunman was leaving. Four women and a man were found dead inside an apartment and another man was shot dead in the building's hallway. All six victims apparently were from the same family. The gunman then started firing on the street and at the police, who cornered him, Spisiak told TASR. A woman who apparently stepped onto her balcony as the shooting rampage was in progress also was killed. Her body was found later in the day by her husband, Lipsic told TASR. The gunman was not immediately identified.